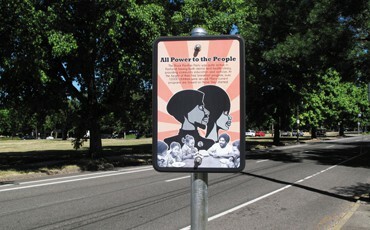 Cleo Davis and Kayin Talton Davis's new work along N Williams Ave titled "The Historic Black Williams Project," includes 30 mounted signs and 10 sidewalk tiles that honor the role the African American community has played in Portland's history. RACC is co-sponsoring the next RACE TALKS, Tuesday, August 8, 2017; “Williams Avenue Black History Corridor”; at McMenamins Kennedy School, 5736 NE 33rd Avenue; Portland, OR 97211; Doors open at 6 pm; Newcomers Intro 6:45 pm; Food and drink available for purchase. N Williams is changing. A lot. What many now living, working and playing in the area don’t know is that for the majority of the 20th century, N Williams/Albina was Portland’s largest African American community. Join our speaker panel to learn how the Historic Black Williams Project highlights this chapter of Portland history through a multimedia public art project. Speakers share the history of Albina, the impetus for the Historic Black Williams Project and how art can be a catalyst for Social Justice action and reform.